A young man Anacleto Figueroa fell in love with a girl from a village in Tequila. That’s why he started looking for a job as a jimador. He thanks Saint Anthony because now, thanks to his efforts, they will get married. 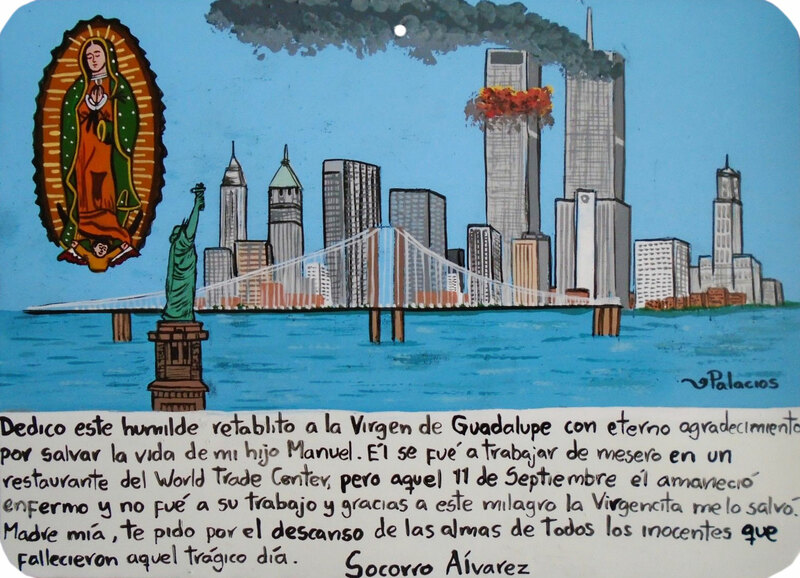 I dedicate this humble retablo to the Virgin of Guadalupe with eternal gratitude for saving the life of my son Manuel. He worked as a waiter in a restaurant in the World Trade Center, but on that September 11 he woke up sick and didn’t go to the work. Thanks to this miracle the Virgin saved him for me. My mother, I ask you for eternal rest for those innocent souls who died on that tragic day. Since I have a good body, a friend of mine invited me to work at his club as a stripper. I accepted the offer because I’d earn very good money this way. One night I was frightened to see one of my aunts in the first row. My family didn’t know what I was doing. I thank Saint Michael the Archangel because my aunt agreed to keep my secret and I promised not to tell about the places she loves to visit. Nayely gives infinite thanks to the Lord of Chalma for letting her find job as prostitute to support her family and to pay for her son’s heart surgery whom she loves so much. 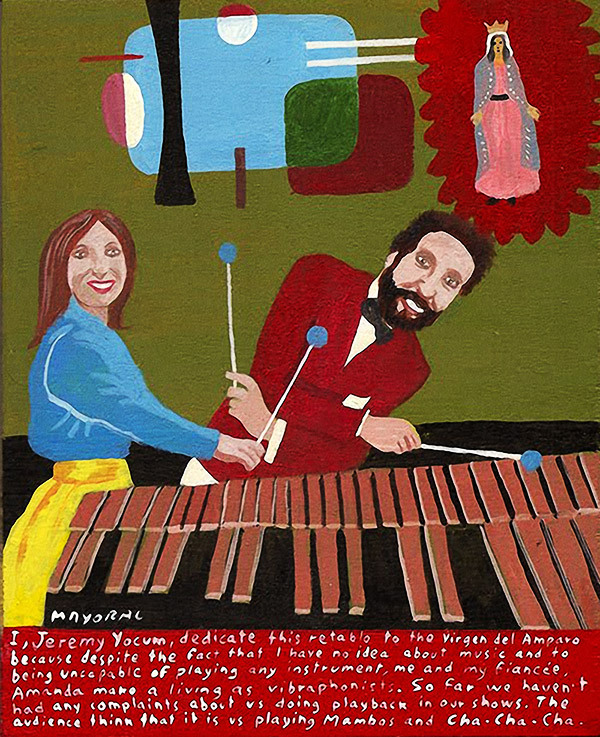 I, Jeremy Yocum, dedicate this retablo to the Virgin Protectress because despite the fact that I have no idea about music and to being incapable of playing any instrument, me and my fiancée Amanda make a living as vibraphonists. So far we haven’t had any complaints about us doing playback in our shows. The audience think that it is us playing Mambas and Cha-cha-cha. 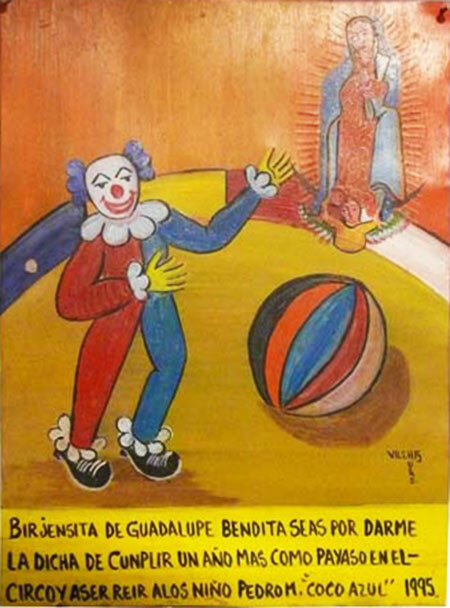 We dedicate this retablo to Saint Peter because we hot a job at the State Fair. 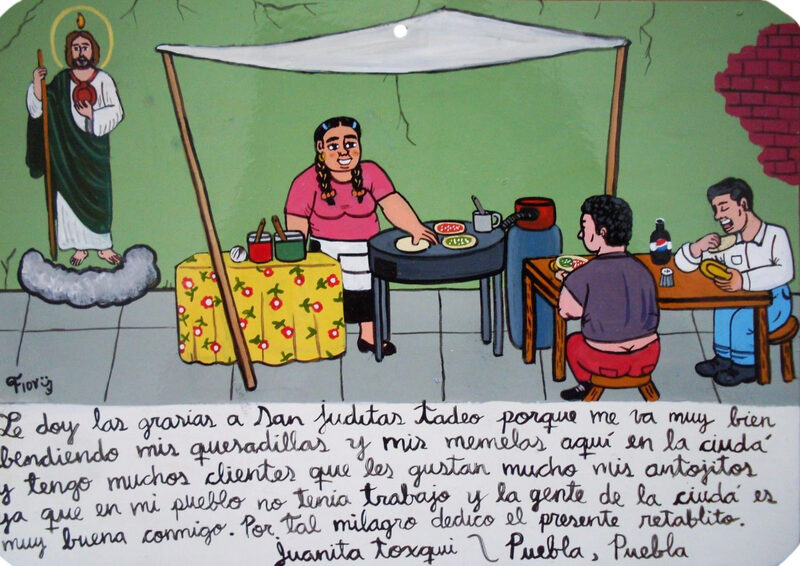 I dedicate this retablo to my mother thanking her for giving me life and blessing me. My life has been always filled with Faith, Hope and Love. And there, in heaven, where she’s resting now, she won’t leave me alone in my mission because the art is the real miracle. 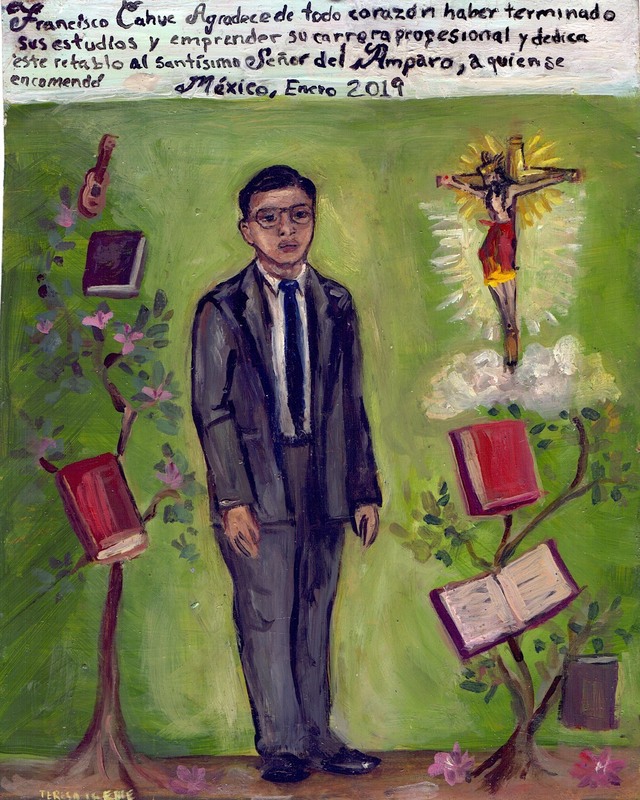 I also dedicate this retablo to my wife for her love and constant support; to my children for their loving friendship and honesty; to the society and people who enjoy my work and let me tell about stories, facts, visions and imaginations from my beloved Mexico. 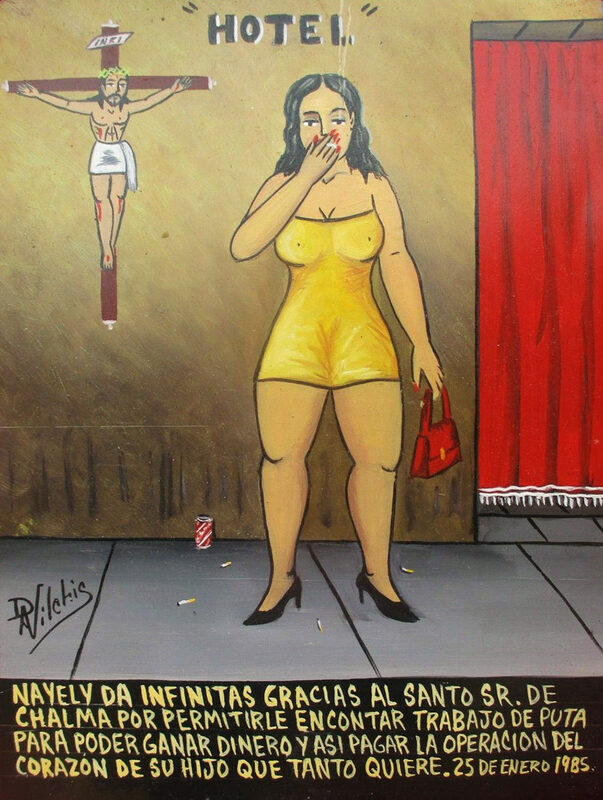 I dedicate this retablo to the Virgin of Candelaria because she blessed me with a very beautiful body, although I have very short legs. Thanks to my beauty I was able to become an exotic dancer in a very refined gentleman’s club. Francisco Cahuc thanks wholeheartedly for having finished his studies and beginning his professional career. 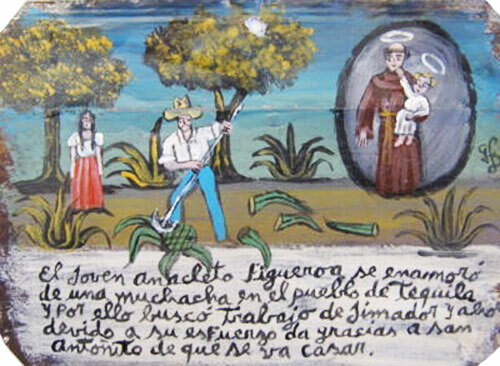 He offers this retablo to the Holy Lord Protector to whom he had entrusted himself. I was going to a job interview in a very important company, so I put my best suit on. While I was waiting at the bus stop I didn’t pay attention to a puddle near it, and when a car passed by at high speed it splashed me all over. I thank Saint Maroun because they were understanding in the company and valued my knowledge and not my appearance and they gave me a job. 1927, Benita Ruiz’ husband kicked the bucked and she was left all alone. 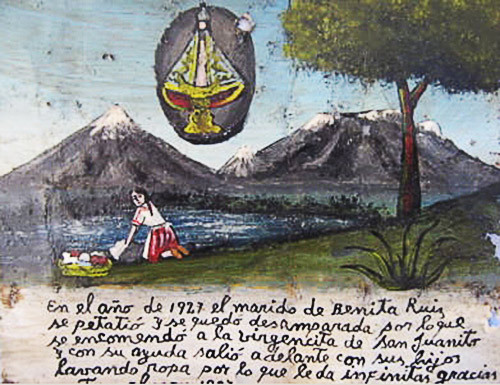 Benita entrusted herself to the Virgin of San Juan, and with her help she could survive with children working as a laundrywoman. She thanks the Virgin. I thank Saint Jude Thaddeus because I’m doing very well selling quesadillas and memelas here in the city. I have many clients who love my snacks. Back in the village I had no job, and the city people are very good with me. 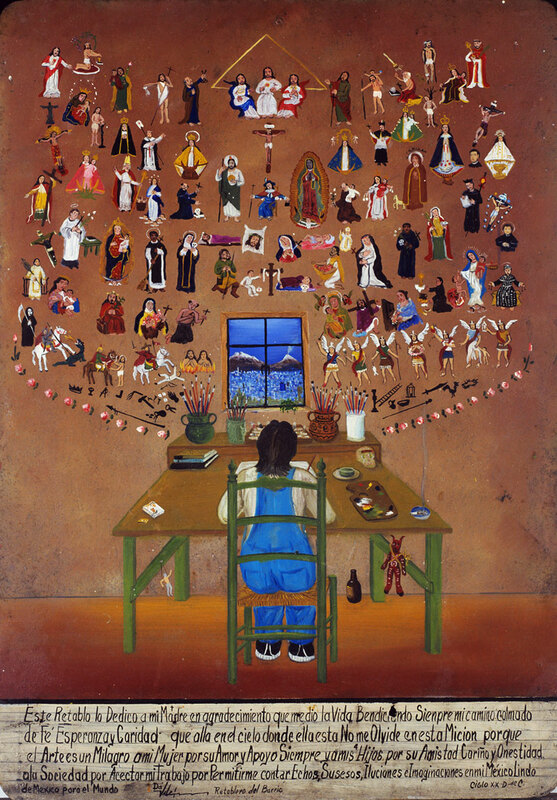 For such a miracle I dedicate the present retablo.